It’s Masonic Meme Monday on the /r/freemasonry Reddit, and though the conversations about this have passed, the sheer number of downvotes a meme gets within minutes of being posted indicates that the idea of Freemasonry being mocked in any way is still a controversial subject. It mainly comes down to a fight between the Pancake Flippers and the Martinists on one side and the Pancake Flipping Martinists on the other. Which is a lot of Reddit-nonsense for the Ol’ Timers and Esoterics vs the Kids (at heart) Who Don’t Take Themselves Seriously. Wow, that’s a lot of capital letters. The question at hand, really, is should freemasons have a sense of humor about freemasonry? As for memes, the accusation is that they belittle the serious work of the craft, and if I have my own gripe about them (despite actively practicing it) it does involve poking fun at ourselves, and as a result, your brothers. 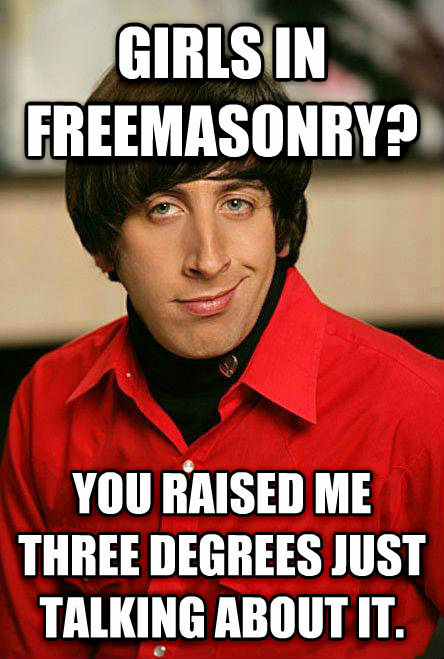 We poke fun at masonic stereotypes, but let’s face it. They wouldn’t be stereotypes unless some of us really did those things. In lodge meetings this can get even more controversial. I don’t think anyone would argue for cracking wise during a degree, but I’ve seen, and been a party to, some absolutely pancake-flipping hilarious hijinx during meetings, even during some of the opening and closing work. Is it appropriate? I guess it depends on what kind of person you are and what you’re looking for. Thank G-d for traditional observance lodges, because I really believe there should be a place for everyone in freemasonry. I think humor is essential to our Craft, however. The thing that I like about ritual, and being in lodge, is that once you cross that threshold, apron on, and ready to go, you have this chance at briefly being the person you’re intended to be. You’re existing in this state of uprightness, on the level, and by the square. You are, hopefully, a responsible, disciplined person, more charitable, more faithful, more fraternal, more…just more, and hopefully some of it carries on beyond the closing. A little bit more each week. I sincerely believe that the goal of freemasonry is to give you a chance, in a way that even going to religious services doesn’t, to be the person your G-d wants you to be. It’s study of humanity through faking. And then I ask myself, does G-d want me to be funny? Well, yes. Of course. That’s why he made knock knock jokes. I mean, that’s why this world is, at times, so damn funny. He wants us to laugh. It’s all over the Torah. He cracks jokes. Weird, lame Biblical jokes, but He makes them. He names Abraham’s son Isaac, which means laughing! The Craft is meant to be solemn, and respectful. Absolutely. The work needs to be taken seriously. Absolutely. But this doesn’t mean it can’t also make us laugh. If that house not made with hands involves removing any mirth in my life, count be out, brothers! A great example of my kind of freemasonry, by the way, is best expressed by the boys at the After Lodge Podcast. If you haven’t heard them, give ’em a listen. But that’s my take. Give me yours. This entry was tagged controversial subject, Masonic memes, Pancake Flipping Martinists, The Craft. Bookmark the permalink.